Bears and Volcanoes - as the name of this trip suggests it is both about seeing the volcanoes and seeing the bears. A Geological Safari - we have the opportunity of seeing elephants, rhino, lions, zebra and antelopes. Gold, Diamonds and Mammal-like Reptiles - visits Karoo National Park where tortoises and snakes may be seen. In Golden Gate Heights National Park we may see wildebeest and antelopes. 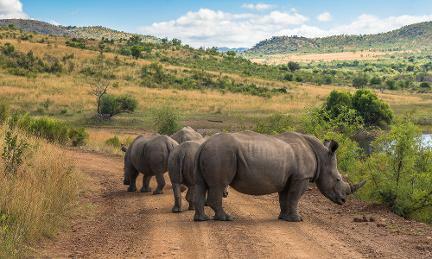 We also visits Piliansberg National Park which accommodates virtually every mammal of southern Africa and is also home to healthy populations of lion, leopard, black and white rhino, elephant and buffalo - Africa's Big Five. Falkand Islands, South Georgia and Antarctica - South Georgia is sometimes referred to as the Galapagos of the Southern Ocean. There are literally millions of penguins and fur seals with many elephant seals and whales too. 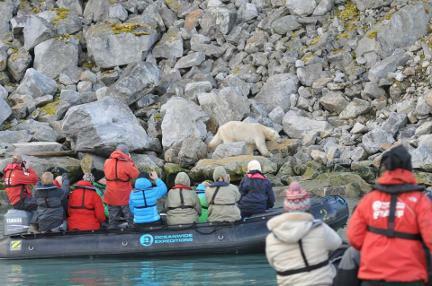 Multiple trips - on all trips to Svalbard you are likely to see polar bears, walrus, whales and birds. Blue whales are sometimes seen in Svalbard and around the volcano of Jan Mayen. Yellowstone, Dinosaurs and Grand Canyon - as we drive through Yellowstone checking out the geysirs and volcanic rocks there will also be much wildlife roaming around including bison and elk and if we are lucky bears.